>> Instilling Biblical Truths into My Grandchildren – Jesus IS Coming Again! 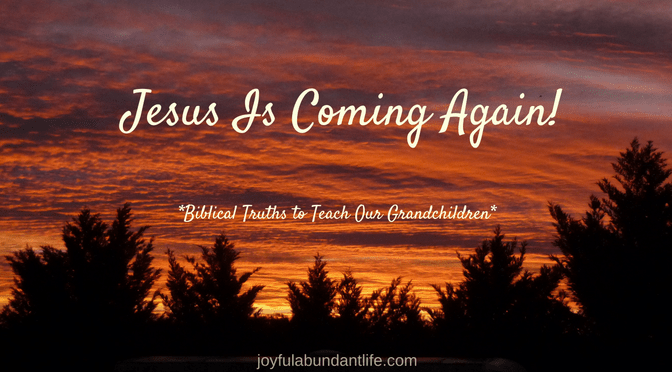 Instilling Biblical Truths into My Grandchildren – Jesus IS Coming Again! Jesus IS coming again! Don’t ever let anyone tell you different! No man knows the day nor the hour, but it is going to happen. He is going to come in an instant, in the twinkling of an eye and we had better be ready. Many may mock and say He will never come. Why just look how long it has been and He has not come yet. But I tell you He IS coming! God does not lie. Look how long Noah preached and built the ark. He was mocked, but guess what? It happened! And all the world was destroyed because they would not believe. Yet, God was long suffering for He is not willing that any perish. He gave everyone opportunity to get on the ark, but only Noah and his family were saved. Look how long it was before the Messiah came. Many lost hope and decided it wasn’t true. And when it did happen most did not believe. His own people rejected Him; He came unto His own and His own received Him not. Now over 2,000 years later, people still do not believe the Messiah has come. He is rejected when He has so freely offered salvation to all mankind. Mark it down, Jesus is coming! The day will arrive. He will come as a thief in the night and many many will be left behind. I want my grandchildren to know the Lord as their Savior and to be ready for His coming. Once saved we need to be living daily for the Lord so that we are watching and waiting for His coming. Won’t that be a glorious day. The dead in Christ shall rise and those that remain shall be caught up in the air to meet Him. Are You Ready? 1 Thessalonians 4:15-17 For this we say unto you by the word of the Lord, that we which are alive and remain unto the coming of the Lord shall not prevent them which are asleep. For the Lord himself shall descend from heaven with a shout, with the voice of the archangel, and with the trump of God: and the dead in Christ shall rise first: Then we which are alive and remain shall be caught up together with them in the clouds, to meet the Lord in the air: and so shall we ever be with the Lord. I look forward to His coming. I looking forward to spending eternity with my loved ones. I look forward to all my grandchildren trusting Christ as their Savior. Let us be looking and waiting for the glorious day when we shall be forever together with the Lord. Jesus is coming and it could be today!